2017 update: Links have been updated below; you may also want to check out our latest discussion of how to pamper yourself when you’re sick. I use Zicam’s zinc spray or melts, at the very least before going to bed (if not first thing getting up and at regular intervals thereafter). I hate the way it makes my mouth feel — HATE IT — but I always tell myself that I would rather have my mouth feel like carpeting for a few minutes than get sick for a few days. I avoid dehydrating things if at all possible, and limit my coffee and alcohol intake. I try to get a good night’s sleep if possible. Maybe I’m crazy (or just a “I think I have a cold coming on” hypochondriac) but I’ve successfully avoided a few colds this year through these steps, I think. Readers, what’s your best advice for how to ward off a cold? Social media image credit: Pixabay. Readers, what do you do when you feel a cold coming on? How do you ward a cold off — and how do you prepare for one if you can feel it coming? When do you “call it” and declare yourself too sick to go to work? I get as much rest as possible. If I don’t things will get a lot worse than they need to be. I drink a lot of hot drinks (mostly tea), something about hot things killing germs, and I drink orange juice. Once a cold hits I jump straight to the chicken soup, warm bath, and vicks vapor rub. I mostly work on the preventative measures though like washing my hands a lot, always getting rest, and eating well. Oh, and I stop going to work when I’m going to get other people sick. My coworker came to a conference with us sick last year, and I got one of the worst colds of my life from her (not the flu). I ended up having to take a day off because of her. Very appropriate question as I definitely have the “I have a cold coming on” syndrome right now. I’m currently at work, as I’m not coughing or sneezing. I am drinking lots of water (hydrate) as well as took an emergen-c packet. Sucking on throat lozenges. I dose up on Tylenol before I go to sleep to ward off any fever. And definitely wash my hands and all surfaces I’m touching. And similar to kerrycontrary, when I am sick, I don’t go to work. But right now I’m not spreading any germs to anyone and am holed up in my office. This is something I am working on. Unless I am really ill, I can usually do my work from home. Need to do that, and when I am really ill, take the sick day, get in the bed and rest! This is something I also need to work on. When I was growing up, my mom (a nurse) was of the philosophy that if I wasn’t vomiting or running a fever then I was going to school (there were occassional exceptions, such as the morning I woke up literally unable to speak). I’m still kind of the same way, which I’m sure my coworkers really appreciate *insert sarcasm font*. The kids have to make up so much work when they take off that it is really an incentive to make them go to school. It is inane to make a kid make up work sheets. I wash my hands a lot, which helps. Not helpful is my office automatic faucet, which NEVER GETS HOT and is a pitiful little trickle. Sometimes I wash my hands in the office kitchen instead. Lots of hot drinks, lots of sleep (if I can with the baby, LOL), and just generally taking it easy *before* I am sick seems to help it pass more quickly. I used to use the zinc lozenges but stopped bc they make it impossible to sing. I go to Emergen-C. I’m not convinced it works at all once symptoms start coming on, but it does help with the hydration factor. Also a bit of a placebo effect, I think. And this winter I’m washing my hands a lot more than in the past. I try to leave work as fast as possible when I’m coming down with something. Typically, I leave work within 45 minutes of “oh no, I’m getting sick” and go home to crash on the couch. I take extensions and check email only as needed. I end up sleep in 3-4 hour chunks throughout the day and check email between naps. I drink lots of hot water with honey and/or lemon and get take-out Pho. When I move into recovery mode and not contagious anymore (usually after 1 or 2 days), I head back to the office and medicate with Emergen-C, sudafed, and lots of water. Lots of handwashing, lots of water, try to get lots of rest. Oh, and I love Zyrtec D for upper respiratory symptoms. But fortunately I am rarely ill. I almost never stay home sick from work because what I do really has to be done by me, on site, and if I am off it inconveniences a lot of people as well as messing up my own schedule. But I have a big office I can hide in, I don’t come in close contact with people, I am religious about handwashing, and as far as I know I haven’t infected anybody. The only unplanned sick day I’ve taken in the past 7 years is that one time when I had food poisoning. No soldiering through something like that, I’m afraid. I totally agree with all of your tips! Especially the Zicam (or generic drugstore brand zinc spray). Nothing works better for me…not Emergen-C, Airborne, etc. And yes, your mouth feels like a barren desert but better than being sick. Have you tried the Zicam melt-away tabs? I hate hate hate the nasty metallic spray, but the orange-flavored tabs are almost unoffensive. Almost. And agreed, Zicam is the ONLY thing that works for me once a cold starts. Amazing stuff. Oh – and so far as preventative measures – my friend (I don’t have kids, but she does) swears by using paper towels in the bathrooms/kitchen rather than regular hand towels. Apparently it dramatically has limited the germs spread among family members in her household (and her siblings’ households) – of course, not super earth-friendly, but you do what you can. Emergen-C and Cold-Ez are the way to go when I feel it coming on. I’ve been able to ward off sickness lots of times with the combination of the two. I especially use them when I have a lot of sick co-workers (who should be home!). I try to get home as early as I can, strike/postpone all other things from my to do list and go to bed with a hot pad, as soon as I’ve downed a glass of orange juice, vitamin c and zinc tablets and a cup of hot chicken broth. I increase my sleep/night rate by 20-50% in times of illness. I definitely agree with the recommendations to stay well-hydrated and get a lot of rest. The other thing I do is take a zinc supplement once per day for a week (not longer, long-term zinc use can be problematic) as soon as I feel the first symptoms. Not Zicam, not zinc cough drops – an over-the-counter vitamin-type zinc supplement. They are available in a range of doses in tablet form, usually 30mg or 50mg; according to the NIH (source: http://www.nlm.nih.gov/medlineplus/druginfo/natural/982.html ), amounts of more than 40 mg per day aren’t recommended, so I try to stick with the lower-dose ones. For the record, I’m not a clinician or any kind of medical expert – I got that advice from a pharmacist, but it does seem to work for me. I’ve found an herbal supplement called “Wellness Formula” that I really think helps keep things at bay, or at least reduce the duration/severity. I never take it as much as the label says too, and it will give you some nasty burps, but overall worth it to cut down the sick days! I have had a sore throat on and off for weeks and the “plague” as I call it hit my ENTIRE team when I was (thankfully) out on Xmas vacation… so since I’ve been back I invested in gold bond’s hand sanitizer moisturizer for my desk – this way I don’t have 2 steps and I put it on every single time I leave my desk and come back. I also take at least one emerge-c a day, and a couple echinacea pills (nothing proven but I swear it’s been a lifesaver for me many times). I drink a ton of water as it is, so I stick with that and try to hit my bed early… knock on wood it has not turned into anything and has seemed to of gone away! I also use Zicam spray and daily take a multi-vitamin (regardless of season/cold coming on). I’m a fan of homeopathic remedies. If I feel something nasty coming on I take a multivitamin, 5000 IU of vitamin D, an Emergen-C packet, drink a “tea” of garlic, ginger, Manuka honey, & lemon (my yoga instructor swears by this tea; it’s probably snake oil but I drink it anyway), chug a bunch of water, and go to bed immediately. Also, no workouts and no alcohol until it passes. I have a feeling that sleeping 16 hours at the onset and avoiding alcohol is probably more responsible for preventing me from getting really sick than the other home remedies. I swear by using a Neti Pot! It helps to prevent my mild seasonal allergies/mild cold into a full blown sinus infection or major cold. When I start to feel not-so-hot, I’ll use my Neti Pot once or twice per day. I notice a big difference in sinus pressure and headaches. It works much better for me than relying on cold or flu medicine alone. Xylitol gum. I’m prone to strep throat and ear infections, and this stuff helps clear them up when I get that “tickly” feeling. I’m fond of the spry brand of gum and mints that you can buy on amazon or at whole foods. Another plus is that the stuff is seriously good for your teeth too! I do NOT know about what I do that has NOT been said before, but I stay AWAY from peeople who are sick so they do NOT get me sick. The manageing partner was sneezeing around Martin Luther’s birthday, and I told him to STAY OUT of my office, b/c he alway’s carries the same DIRTY hankerchief around and with all of the mucos and snot comeing out of his head, it was GROSS! So he stayed away, and I think it worked b/c I stayed well, but Lynn started sneezeing and bloweing her nose. She at least had paper hankerchief’s and did NOT make a mess of thing’s in the bathrom. FOOEY! On the buses, I alway’s hold the railing with GLOVES, b/c there is alot of mucus on peeople’s hands that gets on the railing’s. FOOEY! I haven’t had a full-fledged cold in a couple of years, but I do not recommend my methods to anyone – just sharing my story. As soon as I feel symptoms I start on the Cold-Eez and drinking lots of fluids. I use my Neti Pot roughly once a day to get all the yuck out of my sinuses and nose. This is the gross part – I will brush the hell out of my tonsils and gargle with Listerine or salt water if I feel a sore throat. I have what’s called “cryptic” tonsils and post nasal drip can get stuck back there and cause infections so I try to get it all out. Lots of loogey-hocking in the shower (my husband is so lucky). I also will roast a whole bulb of garlic and spread the mushy cloves on bread. And lots of sleep. Sleep! and inundating my body with vitamins/supplements. If I feel a cold coming on, I make sure to get at least 8 hours a night (yeah easy right?). I take a multivitamin, fish oil, and iron supplement in the morning. At night I take another fish oil and a b complex vitamin. Knock on wood it’s worked thus far. Yes, sleep is the key for me too. I have a daughter who (knock on wood) very rarely gets ill for more than a day or two. And what I’ve noticed with her is that, ever since she was a toddler, if she’s coming down with something she sleeps an absolutely superhuman amount. Like sixteen hours in a day. If she comes home from school not feeling well I’ll know because it’s the only time she falls asleep somewhere other than her bed, and she’ll fall asleep as soon as she walks in the door and sleep pretty much solidly until her normal wakeup time the next morning. And after that, she is 100% fine, almost always. Unfortunately this doesn’t stop her from passing the plague on to everyone else in the house :). So I’ve tried to take a page from her and whenever I feel something coming on I do whatever I can to get into bed and sleep for as long at one stretch as I possibly can. The tough part is convincing myself that everything else can wait for 24 hours, but I find that if I do let myself hibernate it helps so much. I haven’t had colds for years. This year I did have a cold. I’m convinced it was because I’ve used humidifiers in my living room and bedroom throughout the heating season. This year, I was without humidifiers for about 1 month. Ta-da – cold. I agree with the super-hydrating/flushing with lots of water and getting more rest than normal. Decongestant and ibuprofen only as needed, especially when I’m running a fever. May we all have a clear rest of the winter. I swear by a homepathic remedy of vitamin c, echinacea, and zinc. I take 1000 mg of v-c twice a day (total 2000 mg) plus two-125 mg echinacea pills 3 times a day (total 750mg) plus one 30-mg zinc pill. 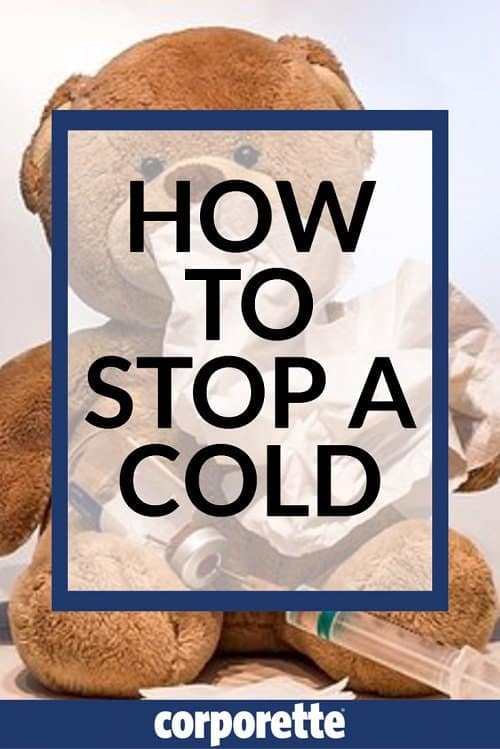 I have an immune system of steel and it is thanks to this regimen – I begin at the first start of a cold (scratchy throat and that dreaded first sneeze) and continue until the threat is gone! You can get all three at the pharmacy. I also swear by echinacea. I actually keep a huge bottle of it in my desk drawer at work. I also use Purell and wash my hands frequently, and avoid touching my face during the day. That is the easiest way for germs to spread! ColdEez/ zinc applied directly to the area the cold virus spread in (nose and throat) has some research to support it. I also use the cold eez spray, because it seems slightly less gross than the other cold eeze methods. I used to LOVE Zicam but I guess I also love my sense of smell. In fact, it might PREVENT some colds. I spray it before going to an “infection zone” like on a plane, the court house, or when someone I work with or live with is sick. Just once a day in those situations. Vitamin C is only supported by the research if you are in a tough environment (I think I read they tried it on Alaskan Fishermen?) But it definitely doesn’t hurt, as long as you don’t take it within 30 minutes of your zinc. This article explains that humidity TOTALLY impacts flu virus: http://www.popsci.com/science/article/2013-01/fyi-why-winter-flu-season This makes me think it might be worth it to humidify my office and home. It at least justifies some time in the steam room at the gym and a long shower here and there! What is this about not taking vitamin C within 30 mins of your zinc?? I’ve never heard of that! And I always take them together. I’d love more info on this. Cold EEZE packaging says this: Avoid citrus fruits and juices, as well as other products containing citric acid, 30 minutes before and after taking Cold-EEZE® lozenges, as they may diminish product effectiveness. So, if you are taking EmergenC, or orange juice, or Airborne, or chewing a C tablet it probably contains citric acid of some sort. If you are taking a vitamin C tablet that doesn’t disolve in your mouth- then no problem. Also, it wouldn’t effect zinc tablets you swallow as compared to Cold Eeze. However, the theory on how cold eeze works is that the zinc gluconate in the throat interacts with the germs. Swallowing a Zinc tab doesn’t do that. Zinc doesn’t boost your immune system, it just harms the virus. I loved the info about the humidity. The article made it easy (and kinda fun) to understand too. I have been using a humidifier at home because my baby’s pediatrician recommended it, but this really justifies having one at work as well. Hope this helps you fellow fashionistas!! If I do catch that cold, I stay away from people, Clorox wipe down everything in the bathroom and run that dishwasher regularly to clean the tea cups and stuff. Eliminate your own germs.